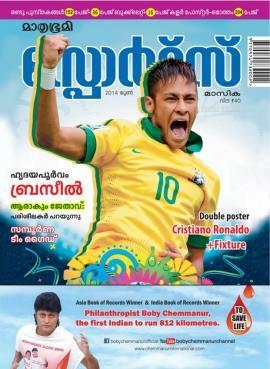 Mathrubhumi Sports Masika is a complete monthly for the sports lovers of Kerala who keep it close to their hearts. Providing an insight into the national and international sports events, 'Mathrubhumi Sports Masika' has already made its own space in the Kerala reading community. Games like Cricket and Football with interesting stories get featured in this magazine. Even after the development of visual media and advent of technology, the popularity of print media remains greater than before. The excitement and thrill offered through words cannot be substituted by a visual experience. For the reason, people around the world follow the latest news and views from their favourite newspapers and magazines. As people of different ages are sports freaks, they use the media to update themselves about their favourite sport event. Sports magazines play a vital role in satisfying the urge of the common man to know the happening of the sporting world. Mathrubhumi Sports Masika launched in 1994 is a complete monthly for the sports lovers of Kerala who keep it close to their hearts. Providing an insight into the national and international sports events, 'Mathrubhumi Sports Masika' has already made its own space in the Kerala reading community. Games like Cricket and Football with interesting stories get featured in this magazine. 'Sports Masika' serves as a companion for sports lovers which update the latest in the sporting arena including Cricket, Football, Tennis and other major sports events. Exclusive articles on sports legends and interviews bring the magazine close to its readers. Printed in multicoloured pages, each issue of 'Sports Masika' is a very special for the readers. Primarily aimed at professional males aged 20-35, this magazine is the most circulated in its niche. Being an a regular reader of 'Sports Masika', the thrills and excitement offered by it cannot be found anywhere. Articles written by sports specialists and journalists flavoured with spectacular photographs keep the real fascination till the last word. During seasonal games like Olympics and World Cup Football, the magazine tries to bring out the best for the readers. With a core team of passionate youngsters working behind the screen, 'Sports Masika' can reach more heights in the future. Centre spread wallpapers of popular sports personalities are another highlight of the magazine.